I got the chance to play the base game of Lanterns at a few conventions over the past year, and my opinion of it was very similar to the OG writers who commented on the original review. The game is a great light game, extremely suitable for gateway purposes, but felt fairly same-y after 3 or 4 plays. At that time, I passed on getting a copy of the game as I felt that I had already fully explored it. The expansion, The Emperor’s Gifts, adds new components and rules to the game that help to add some variety to the game. Players are artisans decorating the palace lake with floating lanterns. The player who earns the most honor (i.e. victory points) before the festival begins wins the game. To set up, the starting lake tile is put in the middle of the play area, and each player is dealt three lake tiles. 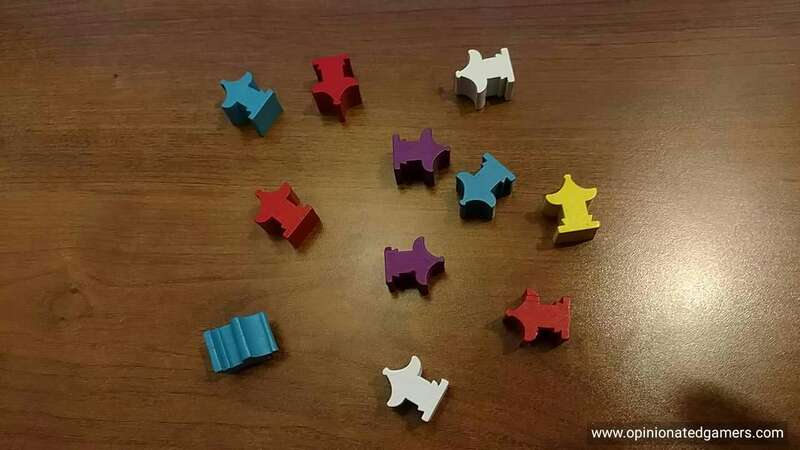 A supply stack is also created, with 20 tiles for a 4-player game, 18 tiles for a 3-player game, and 16 tiles for a 2-player game. The lantern cards are separated, as are the dedication tokens (i.e. what gives victory points), with the number of each varying with the number of players. The edge of the table at which a player is seated has significance in Lanterns, as each player will receive lantern cards based on their seating position. At the start of the game, each player takes a lantern card depending on the color of the starting lake tile (the one with the boat) facing their seat. The player taking a red card (i.e. the player on the red edge of the starting tile) begins the game. Exchange a lantern card (optional). Players will earn “favor tokens” throughout the game as discussed below. At the start of their turn, they may spend two favor tokens to exchange one lantern card for a different one from the supply. Make a dedication (optional). A player may make one (and only one) dedication by trading in a set of lantern cards. The dedication tokens show victory points, with players earning fewer victory points the later in the game, since the tokens with the most points sit on top of a stack. This action is mandatory if a player has more than 12 lantern cards. Place a lake tile and take lantern cards (mandatory). The player places the tile next to another lake tile, and then lantern cards are awarded. First, the active player earns a “matching bonus” if the edge he placed matched the edge he placed next two, with the active player receiving a bonus lantern card of that color. Then, if the matching lake tile has a platform (i.e. symbol in the middle), a favor token is awarded. It is possible that there might be multiple matches, so a player can earn multiple matching bonuses and favor tokens. 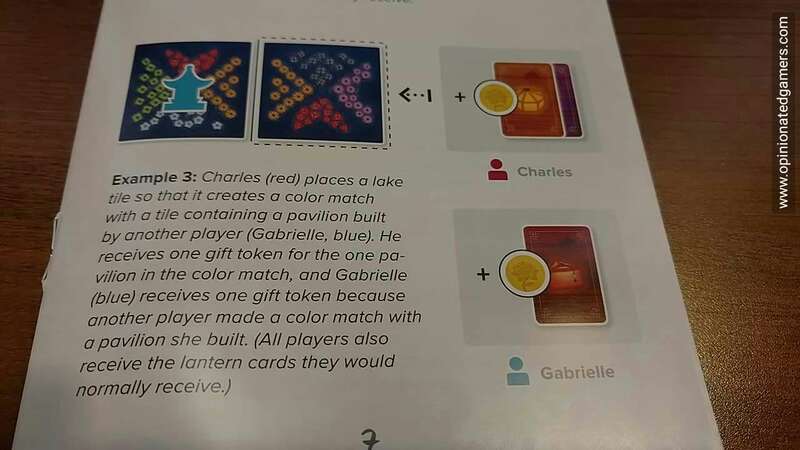 Lastly, each player, starting with the active player, receives a lantern card corresponding to the color on the side of the newly placed lake tile. Four of a kind (i.e. four cards of the same color). Three pair (i.e. six cards, two each of any three colors). Seven unique (i.e. seven cards, one of each of seven colors). The game end game is triggered when all lake tiles have been drawn and placed. Each player then takes a final turn in which they may take the optional actions. After that, players add up their points, and the most points wins. In the event of a tie, the first tiebreaker is the number of favor tokens, followed by the number of lantern cards. OK- so back to the expansion… It uses all the rules from the base game, but adds some new stuff… Each player now has three wooden pavilions which will be built on the tiles. There is a new setup tile included – which should be used in all games with the expansion. The emperor’s special yellow pavilion starts on the center of the new starting tile. A few extra dedication tokens are added to the setup piles. Finally, the five Emperor cards are shuffled and two are drawn at random for play in this game. 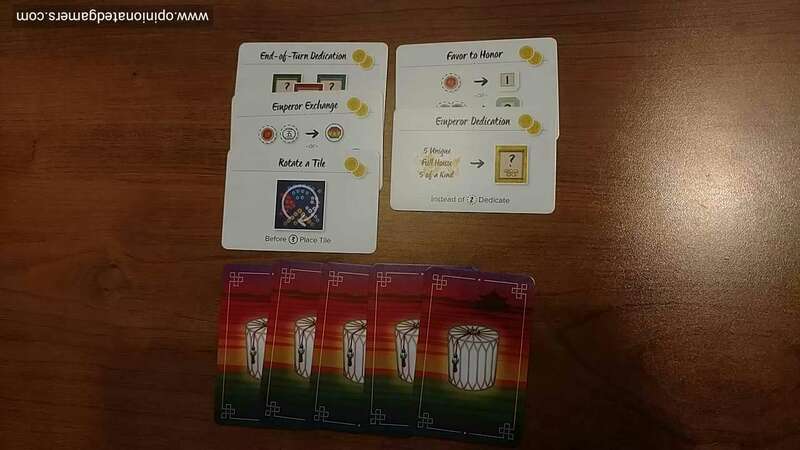 The expanded game uses the same basic rules, and the Emperor cards all give new rule changes when activated. When you build a Lake tile, you do now have the option to build a pavilion on the tile just placed. However, it cannot be orthogonally adjacent to any other pavilion nor can it be built on a platform. Pavilions are used to distribute Gift tokens, a new sort of currency in this expansion. When you place a tile, you still get the same card bonus for matching colors, still get favor tokens for platforms, and each player still gets a card based on what lantern color faces them on the new tile. If there is a color match with a Pavilion, the active player gets one gift token for each Pavilion involved in the match. Furthermore, if the match is made with another player’s Pavilion, the owner of the Pavilion also gets a gift token. Rotate a Tile – spend 2 gift tokens to rotate any tile (that still has at least one open edge) prior to playing your own tile for the turn. This rotation does not affect any previous matches but only those going forward. Emperor Dedication – A new yellow dedication tile stack is set up in the supply. Spend two Gift tokens in the Dedication phase to gain one of these special Dedication tokens – you must given up 5 Unique lanterns OR 5 of a kind OR a full house (3 of one, 2 of another). End of Turn Dedication – At the end of your turn, after you have collected cards, you can spend 2 gift tokens to make a standard dedication. Favor to Honor – place the extra green Honor tokens in the supply. At the start of any turn, spend two gift tokens to convert 1 Favor = 1 Honor OR 2 Favor = 2 Honor. These tokens add to your Honor total at the end of the game. The game is still won by the player with the most Honor. However, the remaining gift tokens now become the primary tie breaker (followed by favor tokens and then remaining cards). As I mentioned at the start of the section, I had always felt that Lanterns was a solid game, and one that would be a great game to pull out as a gateway game for novice gamers. However, the base game didn’t seem to have enough legs to withstand repeated playing – especially with my veteran gamer group. The new expansion gives more variety and variability to the game and has brought it back to the table for a few more plays. I think it remains to be seen if the additions give the game true long term playability, but thus far it certainly appears to be heading in that direction. The five expansion modules all offer a different twist to the rules, enough to cause you to likely change your approach to the game, but not so much that you feel that the base game has been altered. The addition of the Pavilions gives you a bit more strategy in the tile placement phase – both deciding where you want to place your Pavilions as well as matching with other player’s Pavilions. The Pavilion matches are obviously important with the expansion rules because you cannot use any of the new special abilities without a pair of Gift tokens. 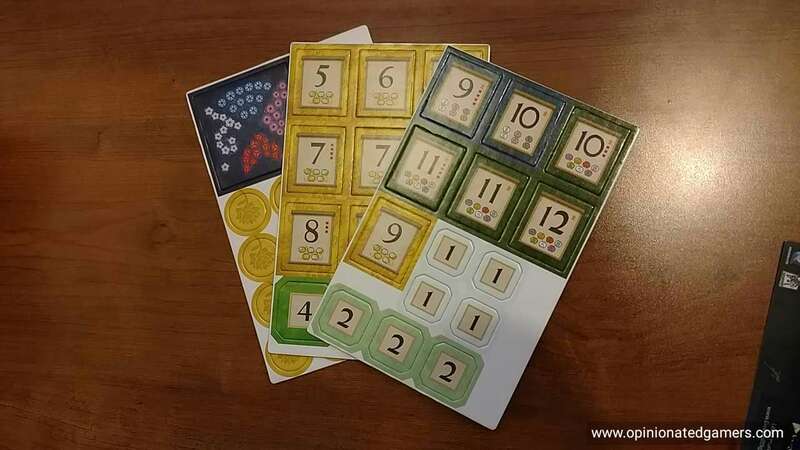 There are twenty different combinations of Emperor cards, and so far I have only played 3 combinations – in the review process, I played three games to make sure that I tried each of the new modules at least once. I can see how different combinations of the Emperor cards will make the games feel different from each other. Thus far, I like Emperor Dedication module the best as I feel that you get a lot more strategic options with the new lower valued (but easier to obtain) yellow tiles – however, I’ve only played with this one once, so it’s still an opinion in progress. The tile rotation module also makes the game much more “gamer-y”, but it can lead to some AP as players may need to spend extra time at the start of each turn looking at the whole board as just about every external tile is a candidate for rotation. The new expansion modules have taken a fairly linear game and added a new dimension to it. The new choices presented with the expansions definitely liven up the game, and after three plays with the expansion, I certainly have no sense of the game fatigue that I had with the base game alone. The additions have moved the game firmly into the keeper range of light filler games for my group. This improvement has also now added a new gateway game to my game collection as I would definitely still use the base game as a introduction to “These Games of Ours”.